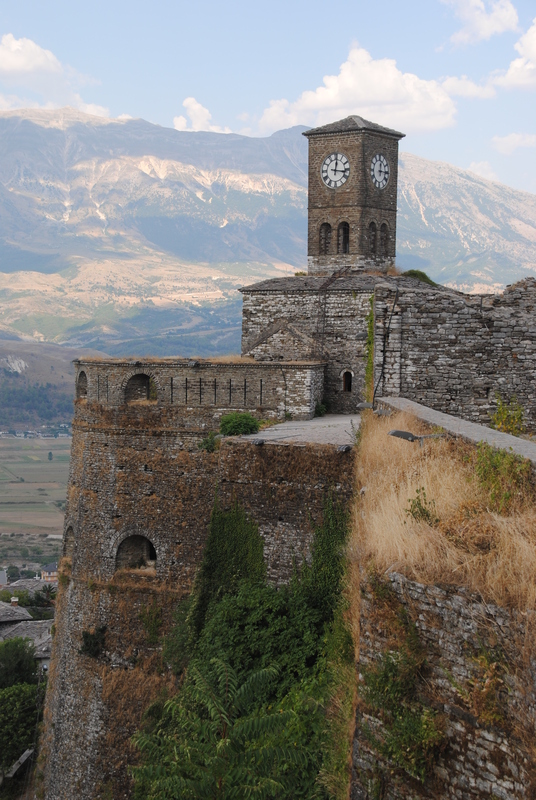 The old town of Gjirokastra is one of the best-preserved examples of an Ottoman-style town in the Balkans. The town is packed with sights, and I recommend to do as we did; buy a map with the main sight. We also bought the book “Gjirokastra the essential guide” made by Gjirokastra Conservation and Development Organization for additional information. We followed the map as best as we could, even though some of the sight were not obvious. It sometimes felt like we walked around with a treasure map, but it was great fun. The facts on both the map and in the book was also very informative and useful. Walking around we saw many different sights, including the hamam, the obelisk, the orthodox St. Sotira church and the mosque. At one point there were 15 mosques in the town, but when the Communists took over after the war they destroyed all but one. The remaining was of cultural significance and was used to train circus performers because of the high ceiling. 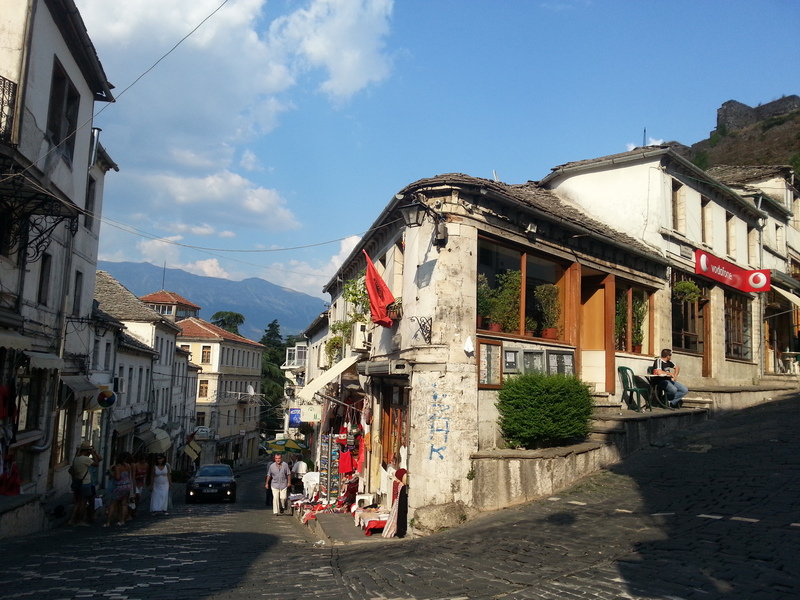 The old bazaar area was the first settlement outside of the castle, and the main city of Gjirokastra until the 19th century. Many of the streets in bazaar area was totally abandoned, and it seemed that only the main streets was busy with shops, restaurants and houses. 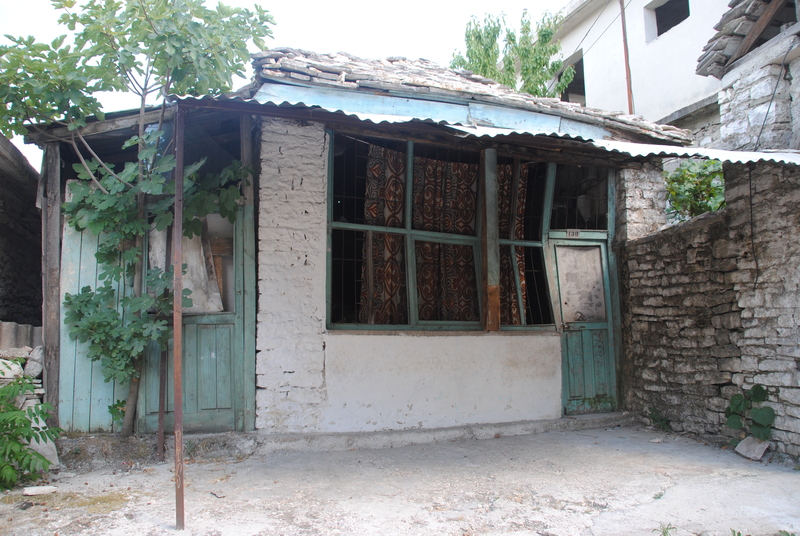 We figured that the houses and shops were probably abandoned during the massive emigration in the 1990s. The residential area on the hill behind the castle was very nice, and also had an enjoyable view. The castle was first built more than 2500 years ago. It was developed further in the Byzantine period (12th and 13th century). In the late 1400s, the Ottoman Empire continued building to the present size and condition. Once you enter the castle, you will go through a hallway with artillery and a tank. We decided to pay additional entrance to enter the prison and weapon exhibition. King Zog built the prison in 1932, and many of the inmates had opposed communism in the period 1944-1968. Inside the prison cells there were writings on the wall stating quotes from personal diaries and news events. 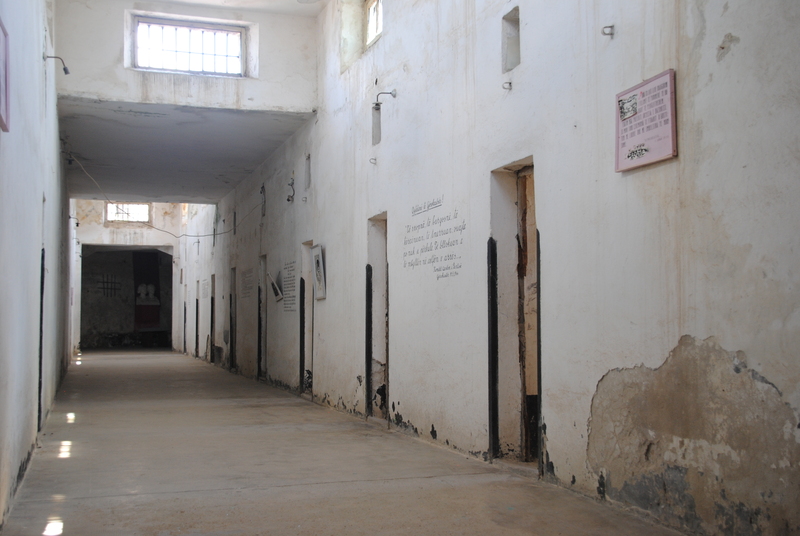 The inner part of the prison had separate cells for punishment, torture and executions. In the 1970s, the Communists opened the prison as a museum. I wish the writings on the wall would have been translated, so we could get more insight in what it was like to be imprisoned and their situation. But it was absolutely still worth visiting this part of the museum as well. The weapons museum had various weapons, mainly “trophies” taken from the enemy during the 1st and 2nd World War. 6000 women fought under 2nd World War. 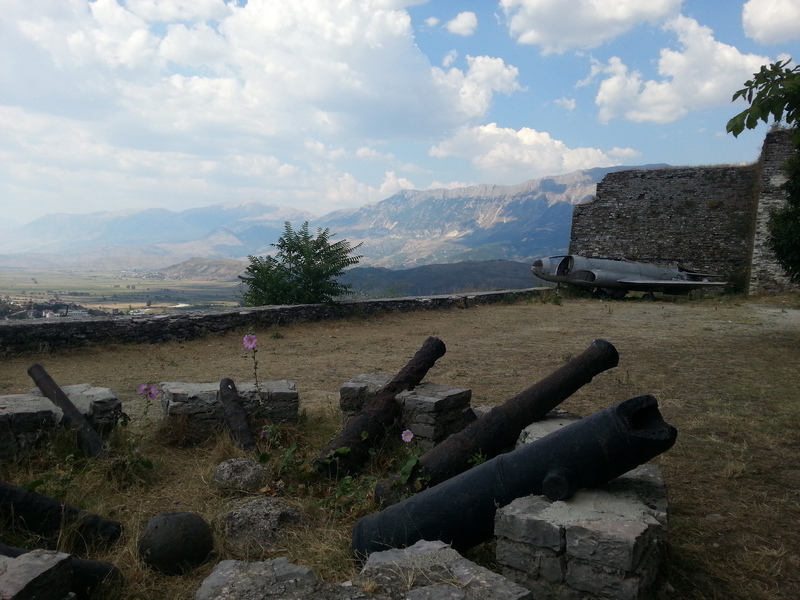 Some of the weapons also dated back from the Bronze and Middle Ages, gathered from all over Albania. Other sight at the castle to be mentioned are the cannon collection with mainly British cannons, the American airplane and last but not least; the clock tower. The plane had to make an emergency landing in Tirana in 1957. It was said to be a spy plane, but the pilot was allowed to return home to the United States. The plane was confiscated by the Communist regime and has been exhibited as a trophy on the castle wall since 1969. The Clock Tower was erected in the 1800s by the Ottoman Empire. They had a long tradition of building clock tower around their kingdom, partly due to the need to control the timing of their five daily prayers. The original clock was stolen either by the Italians or by the Nazis during WW2. The tower was restored in the 1980s, and got a new clock in the 1990s, but it has unfortunately stopped. The Clock Tower is a magnificent construction, and with the mountains in the background, it offer many great photo opportunities. We could move around more or less everywhere, even in the dark abandoned parts of the castle, which now appears to be inhabited by bats. 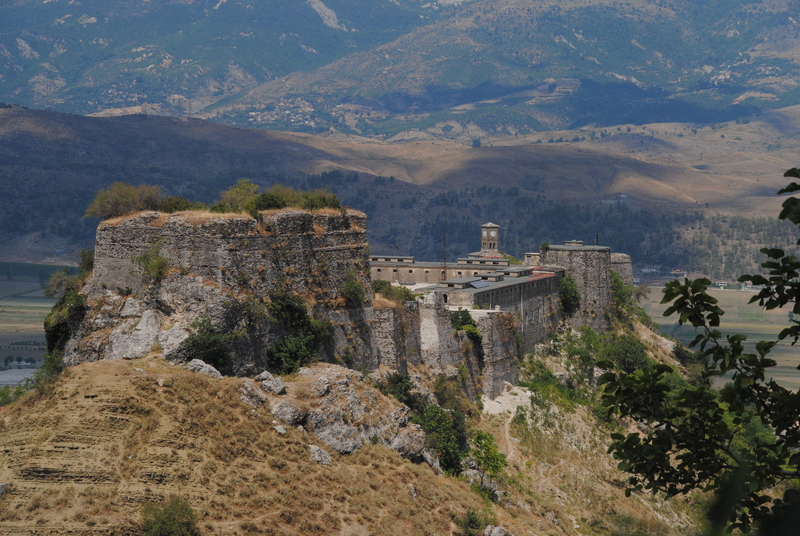 From the castle you also have great views of the town and the surroundings, and I would advise to start the sightseeing in Gjirokastra with a visit here, to get the general overview. 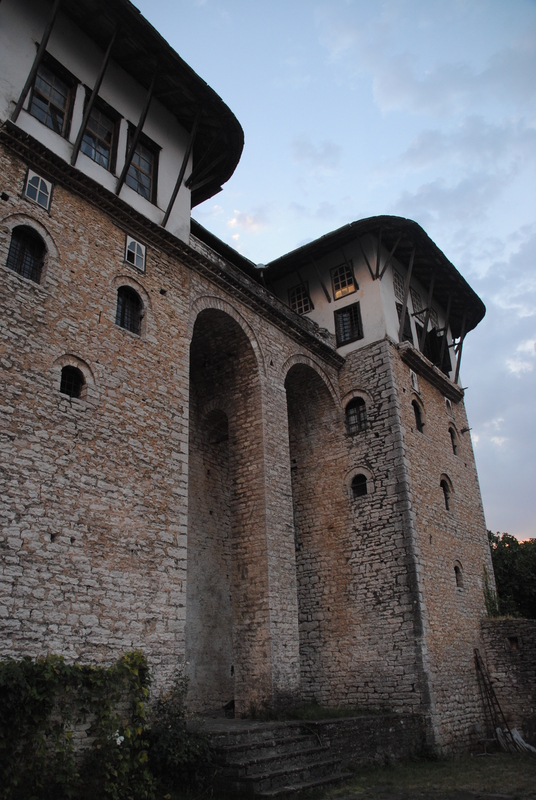 The beautiful tower house in Ottoman style built in 1812 for a general in the Ottoman army, is also worth a visit. The house is now uninhabited and serves as a museum. The neighbor owns the house and opens if you want to enter. There is no light, so it is best to visit while the sun is still up, or bring a small flashlight to be able to see. There is not much to see in most rooms, so you should have some knowledge and imagination to picture how the general and his family lived in the house 200 years ago. The cistern is the first you see as you enter, and the size of this was a symbol of status. On the second floor there was a living room for guests. One corner is slightly elevated from the floor, and was where the guests with the highest status was sitting. The women of the household had a separate room with its own staircase down to food storage and cooking facilities. This room was located right above the cistern, and was cooled by the cold water. The rooms on the third floor was used in the winter since the stone walls made ​​it easier to retain heat. One of the rooms had a small loft, where the women of the house were sent when the men had formal guests. On the top floor there were three rooms, two summer rooms and the reception room. This room featured stained glass windows in several colors and carvings on the ceiling. Absolutely a place I would recommend! It is a very pleasant town with beautiful old houses and a great feel to it. Even though we visited during high season, there were few other tourists there. I would say two days is enough, unless you plan to use it as a base for daytrips elsewhere. The best tip; Just walk around, soaking in the fantastic atmosphere! 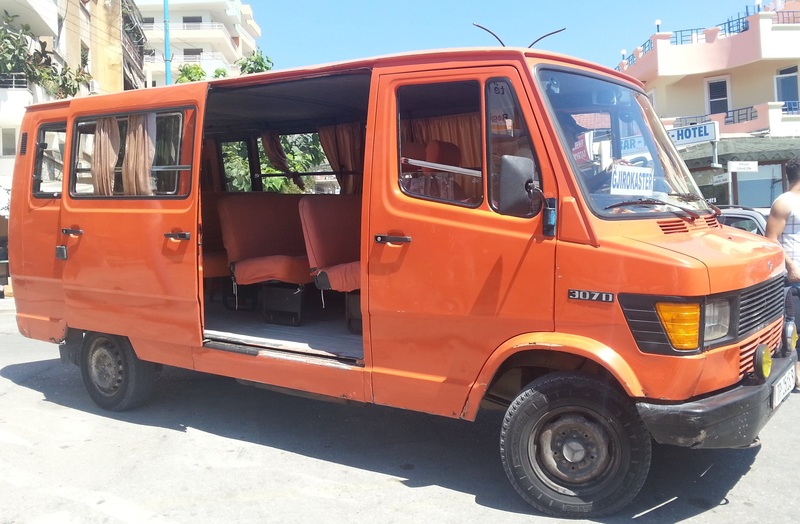 We took the bus from Saranda at 11.30, but there are several busses during the day. The ticket cost 350 Leke per person, and the drive is about 1h 15m. The bus stops in the new town, so from there you can either walk or take a taxi uphill to the old town. There are a few hotels up in the old town, as well as small guesthouses. 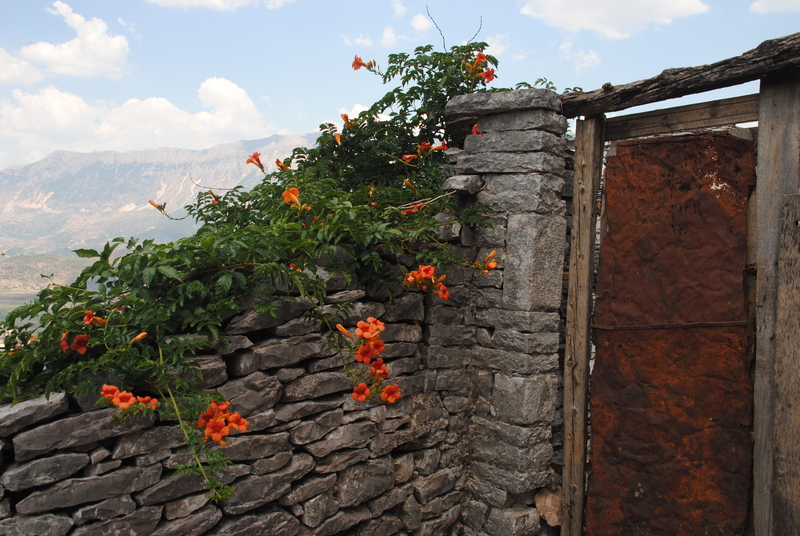 We preferred to stay in an old local house, and booked a room in Hashorva Guesthouse. The stone house is 200 year old, and very charming. It was no luxury, but definitely good value for money, and good location just a few blocks below the bazaar. 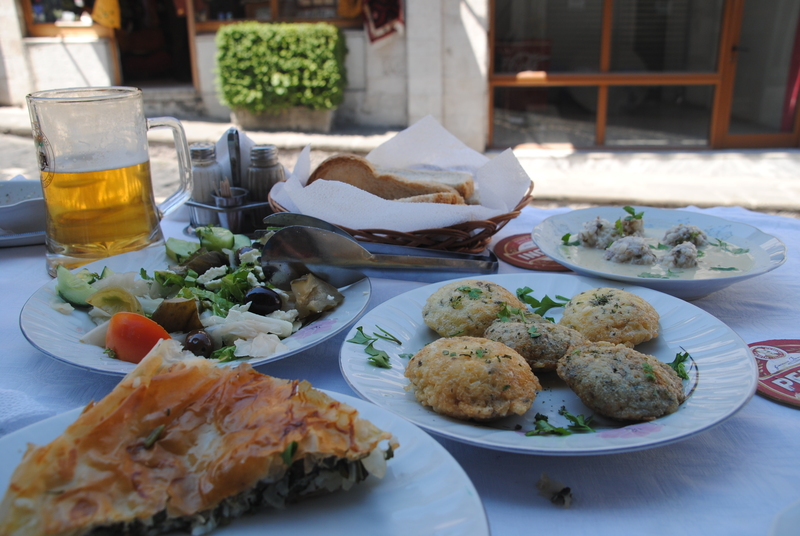 Taverna Gjocka: Albanian food and local specialities, including the rice dish Qifqi that is unique for Gjirokastra. Very friendly staff. Kujtimi Restaurant: Nicely located with outdoor tables in a cosy garden. Taverna Kuka: Nice big outdoor terrace with nice view. A. Muco restaurant: In a small side street with some outdoor tables. Simple but tasty food. Byrek Shop: For a quick snack. Has byrek with different filings. Restaurant Fantazia: It was closed during the day when we were there, but offers great view of the town. Bar Clavis: A great place for some drinks. We enjoyed sitting outside, but it looked quite nice inside as well, with a movie theme on the walls. A little piece of the big city in the small town. In a very positive way.